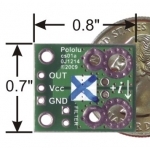 The ACS714 Current Sensor Carrier (-30 to +30A) board from Pololu is a simple carrier for Allegro’s ±30A ACS714 Hall effect-based linear current sensor. 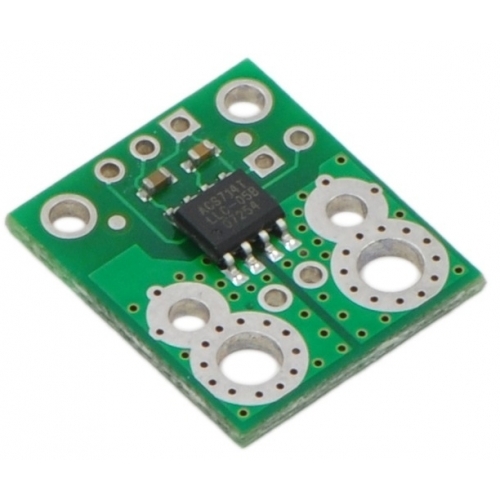 This version accepts a bidirectional current input with a magnitude up to 30 A. The output is an analog voltage (66 mV/A) centered at 2.5 V with a typical error of less than 1.5%. 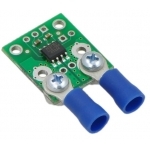 Sensor IC can survive up to five times the overcurrent condition. Automotive grade operating temperature range of -40°C – 150°C. The input current can be connected to the board in a variety of ways. 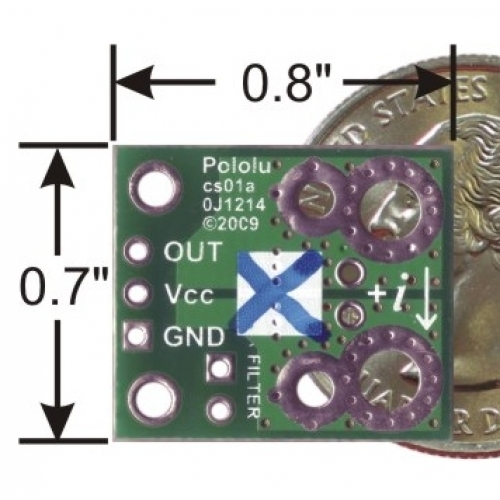 For low-current applications, you can solder male header pins to the board via the small through-holes on the input-current side of the board. For higher-current applications, you can solder wires directly to the through-holes whose sizes best match your wires, or you can use solderless ring terminal connectors, as shown in the picture to the right. The large through-holes are big enough for #6 screws.